For centuries, mankind has observed the sky with the naked eye, and in recent times with bigger and bigger telescopes. Today we study the universe mainly by observing visible light and other forms of electromagnetic radiation, such as radio waves, X rays, and gamma rays. However, recently we have learnt to also exploit other cosmic “messengers”, such as high-energy particles including cosmic rays and neutrinos. With Advanced Virgo, we are attempting to detect a new type of astrophysical messenger, detected for the first time in September 2015: gravitational waves. What are the main sources of gravitational waves in the sky? Below you can find out, and even listen to their “gravitational sound”! When two compact and massive objects such as black holes and neutron stars spin one around the other, they slowly get closer and closer until they finally merge, forming a black hole. This phenomenon is known as coalescence. Such binary systems lose energy by the emission of gravitational waves with increasing frequency and increasing amplitude throughout their long lifetimes. The first experimental evidence for the emission of gravitational waves came from the study of the binary neutron star PSR 1913+16. Russel Hulse and Joseph Taylor were awarded the Nobel Prize for Physics in 1993 for observing that this binary star loses energy exactly as expected by the emission of gravitational waves. Several other binary stars discovered successively behave in the same way. Simulated time series of the amplitude of a gravitational wave generated by the coalescence of two neutron stars located 20 Mpc away from Earth. This gravitational wave would be seen during only 30 s in the Virgo data. Listen to its associated “gravitational wave sound”, the “chirp”! A neutron star is a rapidly rotating, highly magnetised star, which represents the remnant core of a massive star has undergone a supernova explosion. Neutron stars are extreme objects: they have roughly the same mass as our Sun, but concentrated into a sphere of 10-km of radius, and they can spin up to 1000 times per second! If the star is not perfectly spherical, with only a tiny “mountain” on its surface, it will generate continuous gravitational waves. 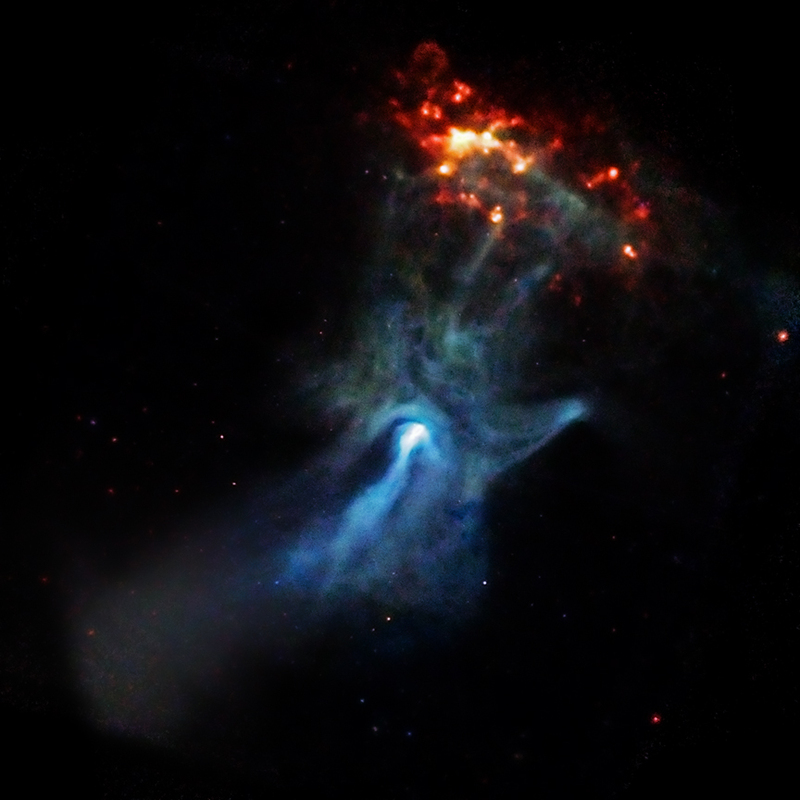 Pulsars are special cases of magnetically asymmetric neutron stars, from which we receive periodic light flashes each time the star makes one turn on itself. Until now, Virgo has not detect any signals from known pulsars, which has allowed us to conclude that their deviation from being perfect balls is less than 1 mm! Observation of neutron stars will provide important information about their internal structure. Advanced Virgo will search for gravitational waves emitted by neutron stars in the neighbourhood of the Sun, and also in our own galaxy, the Milky Way. 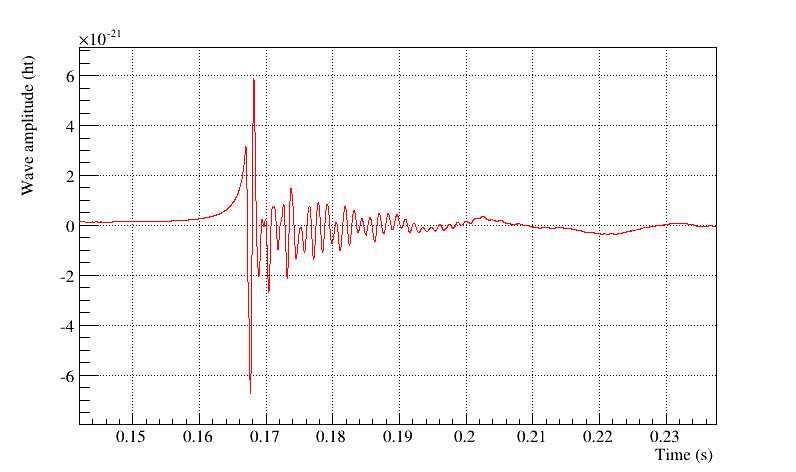 Simulated time series of the amplitude of a gravitational wave emitted by a rotating neutron star. The signal is continuous over years, only a small window of 30 s is shown here. “Gravitation wave bursts” is a generic name given to short gravitational wave signals that last from a few milliseconds to a few seconds. Advanced Virgo will be able to observe the heart of a gravitational collapse of a massive star at the end of its life, known as a supernova. In a galaxy like the Milky Way there are only a few such supernovae per century. Their observation will allow us to better understand what is hidden behind the matter ejected during the explosion and how black holes are created. Simulated time series of the gravitational wave amplitude generated by a core collapse supernova located at 30000 light-years from Earth. 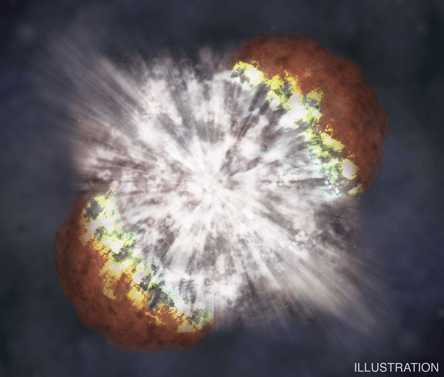 Listen to the “gravitational wave sound” associated to this supernova explosion! Most cosmological models predict that we are bathed in a random background of gravitational waves generated in the first instants after the Big Bang. Detection of such a background would give us insight into the evolution of the Universe, providing a unique probe of the very early Universe. In addition, an astrophysical background of gravitational waves must result from the superposition of all the faint and distant sources that have emitted gravitational waves since the beginning of the Universe. Detection of this background would help elucidate the star formation history and the evolution of astrophysical sources. Every time humans have observed the sky with a new instrument, utilised new light wavelengths or messengers, unexpected objects and phenomena have been discovered. Hence, looking for gravitational waves, we are also expecting surprises! Cosmic strings are just one of the exotic sources that may emit gravitational waves. Play with the Gravitational Universe!